Loch Ken is Open for Business! Home Dumfries & Galloway News Loch Ken is Open for Business! 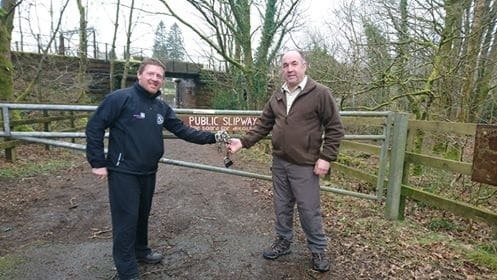 Tom Henry (L) the D&G Council ranger handing the boat registration service to Martin Smee (r), Loch Ken Advisory Management Committee’s new ranger. 01 April signals a new regime on Loch Ken, with the launch of the new Boat Registration & Ranger Service. The new Boat Registration & Ranger Service will be run by the Loch Ken Advisory Management Committee (LKAMC), an established not-for-profit organisation that brings together the range of stakeholders around the Loch including Landowners, Marinas, Community Groups, Anglers and other user groups. Loch Ken, running from Crossmichael to New Galloway in Dumfries & Galloway is the largest body of freshwater in Southern Scotland and is an excellent resource for a host of different user groups, including boats, anglers and a wide range of recreational activities. The Boat Registration Scheme sets out a code of conduct for boat users of the Loch for the benefit of all and supports the ranger service, now led by Martin Smee, on behalf of the LKAMC. Once registered, boats can access the Loch through a number of entry points including the public slipway near Parton. To register your boat, visit Martin at the Loch Ken Marina, a couple of miles north of Parton on the A713. New Short Term Boat Registration Scheme for Loch Ken Launched.